The late Dr. Tench's contribution to the work of AERE, Harwell (C.B. Amphlett). The scientific work of the late Dr. A.J. Tench (M. Che). Photoluminescence and resonance energy transfer in zeolites (D.H. Strome, K. Klier). Surface structure and energy transfer on oxides (S. Coluccia). Electronic and vibrational states at the surface of ionic and covalent solids (A. Zecchina, D. Scarano). Spectroscopic and kinetic studies of surface processes on alkaline earth oxides (J. Nunan et al.). UV diffuse reflectance spectra of ammonia adsorbed on alkaline earth oxides (E. Garrone, F.S. Stone). Surface structure and nature of adsorption sites of supported, reduced and sulfided molybdate catalysts (H. Knozinger). Photo-adsorption of oxygen on acid and basic Ti02 surfaces (G. Munuera et al). Photocatalytic reactions on metal oxides and their excited states (Y. Kubokawa, M. Anpo). Solid/solid adsorption (Xie Youchang et al.). Surface and porous properties of oxides (R.G. Avery, J.D.F. Ramsay). Adsorptive properties of aluminumphosphate molecular sieves (G. Dworezkov et al.). Adsorption on metal oxides (R.G. Egdell). Decomposition of ethanol and acetaldehyde on (ll0) Sn02 faces and sintered Sn02 samples in UHV (D.Kohl et al. ).Surface and bulk oxidation states of Mo03 during the partial oxidation of methanol (J.S. Chung, C.O. Bennett). Electron donor properties of Co0-MgO solid solutions (K. Dyrek, Z. Sojka). The nature of surface species formed upon adsorption of CO, O2 and nitrogen oxides on high surface area Co0-MgO and NiO-MgO solid solutions (D. Cordischi, V. Indovina). The interaction of CO and NO at the surface of Mg0 (E. Garrone, E. Giamello). Surface characterization of Cu/ZnO catalysts (G. Ghiotti et al.). Some infrared spectroscopic studies of the adsorption of molecules on MgO surfaces and MgO-supported palladium catalysts (C.C. Chu, N. Sheppard). Surface modes on alumina (J.C. Lavalley, M. Benaissa). Surface hydroxyl groups of &ggr; alumina (L. Mariette et al.). Surface reaction mechanisms of selective olefin oxidation over mixed metal oxides (R.K. Grasselli). Surface chemistry and reactivity of vanadium-phosphorus oxides (F. Cavani et al.). Nature of active oxygen in selective oxidation reactions (G.W. Keulks, T. Matsuzaki). Alcohol conversion selectivity as a measure of the base strength of metal oxide catalysts (B.H. Davis). Catalysis by alkaline earth metal oxides (H. Hattori). Influence of the support on the preparation of oriented oxide catalysts (J.C. Volta). Co-Mo-O-Ti, a new catalyst effective in butane oxidation to maleic anhydride (J.S. Jung et al.). Structure-sensitive catalytic reactions on oxide surfaces (J.E. Germain). Structure sensitivity in catalysis of vanadium oxides (A. Miyamoto et al.). Adsorption studies on vanadium oxide (A. Andersson). Production of gas phase methyl radicals over lithium-promoted Mg0 (D.J. Driscoll et al.). Redox and catalytic properties of perovskite-type mixed oxides (M. Misono, T. Nitadori). Adsorption and catalytic properties of iron-cobalt oxide spinels (R.R. Rajaram, P.A. Sermon). Direct conversion of isobutane into nitriles (H. Zarrouk et al.). Author Index. The Symposium was held to honour the memory of the late Dr. A.J. Tench who made numerous important contributions to our knowledge of the structure, reactivity and adsorption properties of oxide surfaces. 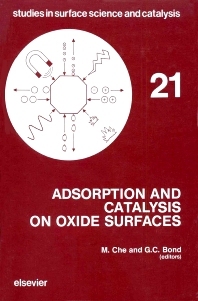 This volume contains an up-to-date picture of adsorption and catalysis on oxide surfaces, not in the form of a comprehensive review but in its living aspects of work in progress. It describes detailed studies on the determination of the coordination surface ions, particularly oxide ions, by photoluminescence and reflectance spectroscopy, on the identification of adsorbed species by magnetic optical or surface techniques and on catalysis, with emphasis on new concepts such as catalysis involving excited states or structure sensitive reactions. Professionals working in the industrial and academic laboratories will find the book particularly useful as it provides a state-of-the-art account of our understanding of the structure and adsorption characteristics of oxide surfaces. Contained in the book are first class research papers by leading exponents in this field. A very important issue is that the book highlights for the first time the importance of excited states and structure sensitivity in determining the behaviour of oxide surfaces.